How long are your arms? How far is your reach? 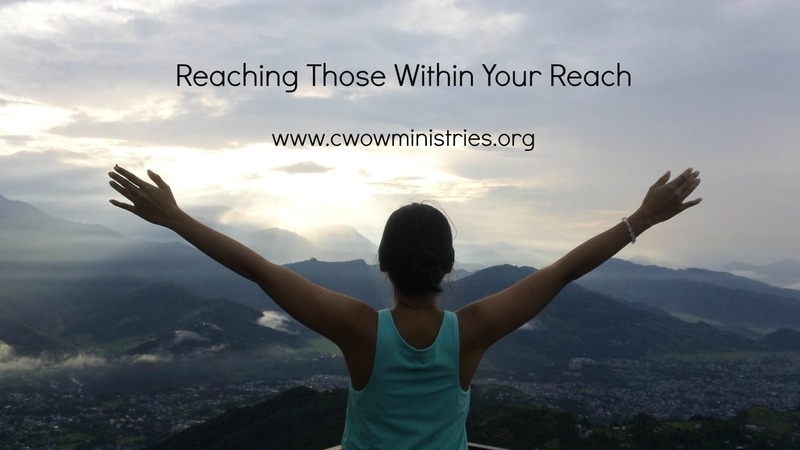 How many people are within your reach? I am confident there are a number of people within your sphere of infuence that you can aid and assist. Examples are neighbors, co-workers, family members, acquaintances, friends, friends of friends, and people you know in passing. In your lifetime, you will not be able to physically reach everyone in need; however, God has placed you at the center of a network of people that you can help. Jesus, in his earthly ministry, did not physically reach every person in the ancient world. However, Jesus met the needs of those who God directed Him to assist. Jesus also gave power and authority to His disciples to reach those outside of His immediate reach. In one instance, Jesus sent out 72 disciples in pairs to do the work. One reason Jesus did this was to teach us the power of partnership and unity as a tool to meet the needs of those around us. We know from scripture that the hungry, sick, and poor will always be among us. No matter how many mouths you feed there will always be more hungry people. No matter how well you care for the sick, more will get sick. No matter how well you clothe the naked, more will need clothes. If you have a compassionate heart, knowing this can seem discouraging. However, don’t become overwhelmed, be of good cheer. You are not called to solve the problems in the world. You are called to introduce the world to the Savior, and not the whole world, but those within your reach. Know this, God is victorious and He has equipped you to provide the necessary assistance to all those within your reach. So reach, stretch, and extend your faith to those around you and within your sphere of influence. Commit to exercise your compassionate mindset starting in 2015.